1. Add all ingredients into a mixing glass. Add ice, shake and strain into a glass with fresh ice. 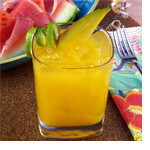 Garnish with a mango slice and lime twist. Serve.